Once upon a time, when a toilet bowl needed to be cleaned, there was a simple plastic-handled, nylon brush that, when combined with a bit of cleaning fluid, would do a perfectly good job removing accumulated body waste. Now, marketers have seen fit, as they have with floor and counter top cleaning products, to produce and market throw away cleaning brushes that, while certainly less disgusting than the old permanent brushes, just make more trash to throw away, filling landfills, already bulging with all the other throw away products invented, seemingly, to make life easier but, in actuality, contribute to the destruction of natural resources. 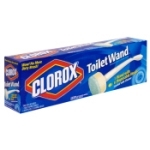 In the face of that, Clorox and SC Johnson are fighting over who can manufacture more trash-generating toilet brushes better and faster with SC Johnson taking issue over claims made by Clorox which SC Johnson says denigrates its product. Apparently, SC Johnson was miffed over a Clorox commercial which poked fun at SC Johnson's "papery version of a toilet brush" and showed it blowing away in the wind while claiming the Clorox brush was preferred 3 to 1 over the SC Johnson brush. That claim was based on, according the National Advertising Division of the Council of Better Business Bureaus, flawed methodology. Clorox, ultimately, pulled its ad. Kinda makes that old, stinky, permanent brush seem a bit more hassle-free.